On April 28, 2018, to commemorate the 25th anniversary of the establishment of the Institute of Intellectual Property of Peking University and the 120th anniversary of Peking University, the seminar was jointly sponsored by Peking University School of Law, the Institute of Intellectual Property of Peking University and the Center for International Intellectual Property Research of Peking University. 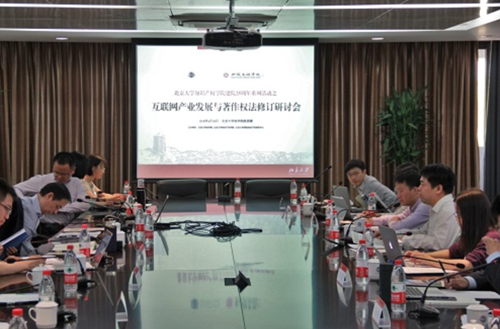 The "Internet Industry Development and Copyright Law Amendment Seminar" was successfully held in Room 303, Koguan Building, Peking University. The conference received a letter of congratulation from Prof. Wu Handong, former president of Zhongnan University of Economics and Law. He congratulated the establishment of the Institute of Intellectual Property of Peking University on the 25th anniversary and wished the conference a success. Professor Yi Jiming of Peking University Law School made an opening speech for this meeting. The meeting was divided into three keynote speeches. The first speech was entitled “The revision of the “Copyright Law of the Internet era”. Under the auspices of Prof. Yi Jiming, Prof. Wan Yong of Renmin University of China, Deputy Director of the China Music Copyright Association Liu. Mr. Ping, Prof. Yang Ming of Peking University Law School , and Liu Xiaochun, Executive Director of the Internet Legal Research Center of the University of Social Sciences of China made corresponding keynote speeches respectively. Prof. Li Yufeng of Southwest University of Political Science and Law and Associate Prof. Xiao Zhiyuan, Vice President of Law School of Zhongnan University of Economics and Law Field Topics made a speak. At the end of the talks, the participants held a lively and free discussion on the theme of this field. The second speech of the conference was entitled “Copyright Pricing in the Internet Industry”, presided over by Prof. Yang Ming of Peking University Law School, Associate Professor Jiang Wei of Tsinghua University Law School, and Professor Chen Yongwei of Peking University Market and Network Economic Research Center. Mr. Chao Zhao, Partner of Jingtian Gongcheng Law Firm, gave a keynote speech. Prof. Yi Jiming of the Peking University School of Law delivered a corresponding opinion as a talker in the conference. The theme of the third speech was "Industry Competition and the Application of the Copyright Law." Associate Professor Xiao Zhiyuan of the Law School of Zhongnan University of Economics and Law, presided over the speech. Associate Professor Cui Guobin, Associate Dean of the School of Law of Tsinghua University, Associate Professor Xiong Wencong of the Central University for Nationalities, and Director of the State Council of China Audiovisual Copyright Collective Management Association talked at the conference. Professor Yang Ming of Peking University Law School participated in the meeting. Then the participating guests held a lively and free discussion on related issues. At the end, Prof. Yang Ming summarized the meeting and thanked the guests for their visits . He hoped that they would have the opportunity to have more in-depth exchanges in the future. The discussion of the guests in this seminar was enthusiastic. It also attracted the participation of many teachers and students from colleges and universities. The meeting lasted one day and ended in a heated discussion among the guests.